Preheat oven or barbecue (grill) following instructions below. Place each salmon fillet in the centre of one 12x18-inch heavy-duty aluminium foil piece. 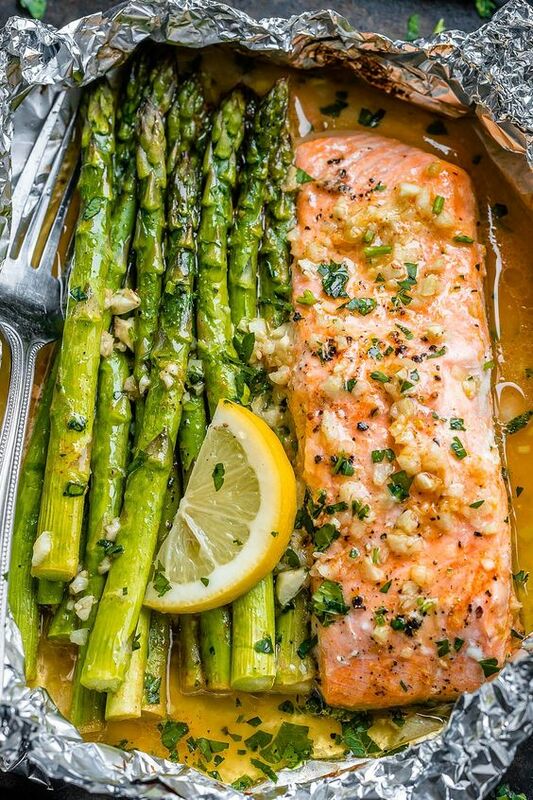 Divide the asparagus into 4 equal portions and arrange next to the salmon on each foil piece. In a small bowl, mix together the melted butter, lemon juice, garlic and parsley. Pour the garlic/butter mixture evenly over each piece of salmon and asparagus; season with salt and pepper to taste, and top each pack with the parmesan cheese (about 2-3 tablespoons per pack). Tent with foil, tightly sealing the edges to prevent the butter being leaked, to create a foil packet. Bake in preheated oven to 200°C | 400°F for 15 minutes, or until cooked to desired doneness. For a crispy top, broil for 1-2 minutes extra until Cheese is golden. Grill, covered on medium high heat for 15-20 minutes, or until cooked to desired doneness. OPTIONAL: For a crispy top, broil for 1-2 minutes extra until Cheese is golden.